There are some subjects that we still don’t really want to talk about and which remain taboo. Gas is certainly a topic that many have difficulty talking about but the reality is that it is a natural process that everyone experiences. The uncomfortable and embarrassing symptoms of excess gas are estimated to affect as many as 140 million people in the US. We all know that some people pass more gas than others! And for everyone’s comfort it would be great if they could get some extra help to relieve those symptoms…..
Watch the video to see that help is out there! There are some natural ways you can try to reduce gas such as taking time to chew your food, peeling fruit and vegetables, drinking more water, and taking exercise regularly. 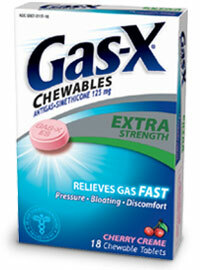 But sometimes you just need something more to help relieve the discomfort and symptoms of gas. The good news is that there are some great over the counter remedies such as Gas X which can reduce the uncomfortable and embarrassing symptoms of excess gas. Gas-X is available in softgel, chewable, and the revolutionary Thin Strips form – so you can take them wherever you are and whenever you need them. The Gas X Thin Strips are the only remedy available for gas in the form of a dissolvable strip. The Thin Strips melt on your tongue so are easy to take. They come in 2 great flavors – Peppermint and Cinnamon. The great news is that right now you can save with this Gas X Coupon so you can try it to see how well it works for you. This post is sponsored by Gas X and contains affiliate links. BabyBjorn Original Carrier just $46 Shipped! 50% Off All Personalized Invites at Cardstore.com! Nintendo Wii just $150 @ Amazon!